I get a lot of questions about how to set the temperature and how to work ovens. Every oven is different. I’ve lived in many places in the US and used a variety of ovens. I’ve even used them in other countries while on vacation. First, if you have a manual for your oven take a look at it. Some of them even come with recipes, see what they say to do for a recipe. If you don’t have the manual do a search online for a manual or specific instructions on your model. These days with the internet you can find instructions for almost anything. When an oven preheats it gets blasted with all the heat in the elements. They are burning hot, hot, hot and not waiting for it to evenly heat the oven to the desired temperature is going to cause your items to not cook evenly. You’ll be putting a cake in and it will get an enormous amount of heat initially causing all kinds of things like a burnt outside and raw inside. 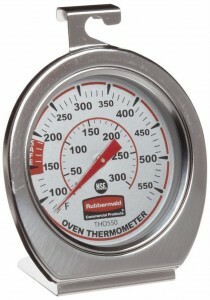 However, the best thing you can do to determine the temperature in your oven is to purchase an oven thermometer. They’re inexpensive and reliable. Now, place your rack in the middle of your oven. Set the thermometer on top of the rack in the center and set your oven to the temperature your recipe calls for. Gas ovens generally use the bottom heat setting for baking. Most items are baked at 325°F/160°C/Gas Mark 3 to 375°F/190°C/Gas Mark 5. Be patient and wait for your oven to Preheat. Some ovens have a light that goes off or a bell that chimes. It doesn’t matter if your oven is gas or electric they all take time to preheat. Some ovens will heat to a very high temperature during the preheat cycle so if your thermometer temperature shows higher be patient and wait for the oven temperature to even out. My oven, which is only 3 years old, generally takes about 15 minutes to preheat to 350°F/180°C/Gas Mark 4 but gas ovens can take much longer. Now that you’ve given your oven time to preheat open the door and see what the oven thermometer says. If the temperature is not what your recipe calls for make adjustments. First, make sure you’ve preheated long enough. Second, adjust your rack up or down and see if that changes the thermometer. Third, adjust the temperature of your oven until the thermometer reads the required temperature. This takes patience because if the temperature reads 400°F/200°C/Gas Mark 6 when it should read 350°F/180°C/Gas Mark 4 you have to wait again for the oven temperature to adjust. I’ve had ovens that the setting was not the same as the final preheated reading inside the oven. I would mark somewhere what the oven temperature should be set at to get the right internal temperature. And as a note when you want your oven temperature to be really high 450°F/230°C/Gas Mark 8 to 475°F/240°C/Gas Mark 9 for things like crispy bread and pizza then you need to wait about a half hour after it says it’s preheated so that the oven walls have time to adjust and get warm.